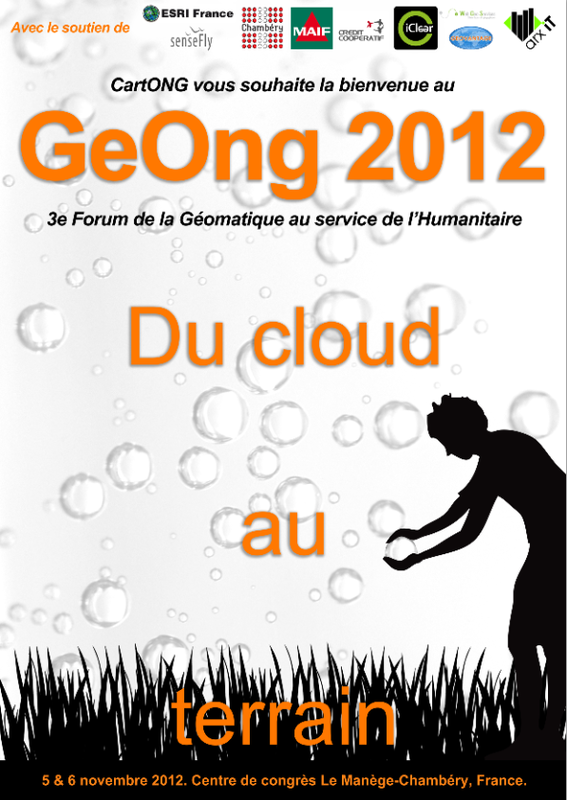 GeOnG 2012, from the Cloud to the field. In two days Chambéry will be the meeting place of around a hundred GIS specialists that intervene during catastrophes or developments projects in developing countries. It is an important moment for the NGO members to get together and exchange, but also an important moment for mapping and the humanitarian field. Apart from the "Crisis Mappers" conferences that take place every year, there are few events in the world to meet and exchange feedback on mapping , GIS and geographical information management in general, with a wide-ranging public (NGOs, UN organizations, private companies, research entities). The meeting is set in a bilingual franco-english setting so that everybody can fit in. After six months of preparing, the plenary sessions, round tables and workshops are finally ready! This time and energy spent for the preparation was significant, especially for Martin Noblecourt, project officer, and also for the volunteers and the small professional team that has dedicated time on top of their usual projects to share the experience of the last two GeOnG events. The sessions will be filmed. You’ll be able to podcast them for you to find feedback on the uses of geographic information in emergency contexts, to follow the latest advances in technologies, to understand the pros and cons of “humanitarian open data”, or just to discover the multitude of actors that use these tools, be it small NGOs or much bigger International Organisations. Let us hope that this third edition will be a success- if we look at the energy spent in organising it, it should be! We would like once again to thank our partners that have trusted us for this new step. You can follow us on the website with access to the presentations, pictures, videos, but also on twitter thanks to the hash tag #geong2012.